Wash and cut up the red potatoes, toss them into a pot of salted fresh water. Bring the water to a boil and simmer the potatoes until they are fork tender. Drain well. Pour the cooked potatoes into a large bowl . While the potatoes are still warm, sprinkle with sea salt and drizzle with extra virgin olive oil and vinegar. Toss to coat and to soften the edges of the potatoes pieces a bit. Add the diced onion, horseradish and toss to distribute. Taste and season with more sea salt and plenty of fresh ground pepper. Add the chopped parsley, dill and caraway; mix. Taste test. Add more olive oil or vinegar, sea salt or herbs. Serve warm (so yummy!) or cover and chill. 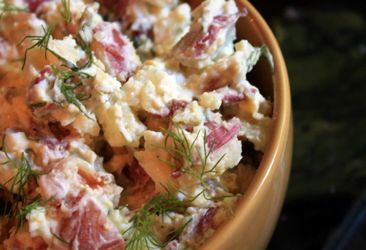 Remember that chilling the potato salad will subdue its flavor considerably. I always season my potato salad more vigorously if I am going to serve it chilled. Taste test after chilling it and add more seasoning if it needs it.